Dream on! 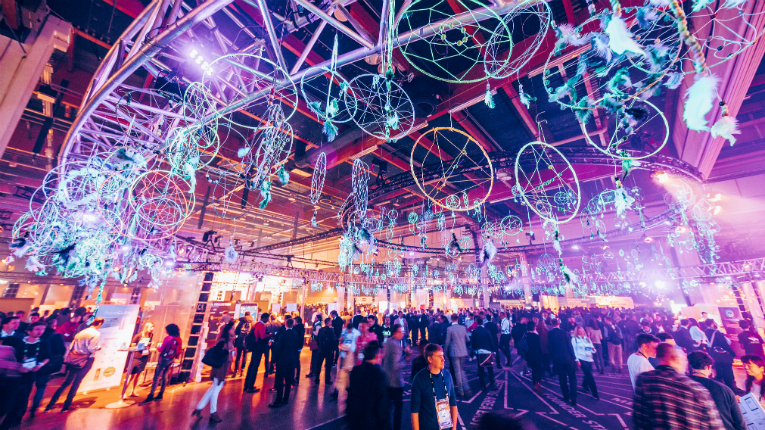 The Slush ceiling, adorned with dreamcatchers. 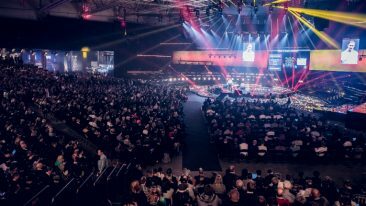 The second day of the Nordics’ biggest startup event got off to a sluggish start, before hitting its stride in typically dynamic fashion. 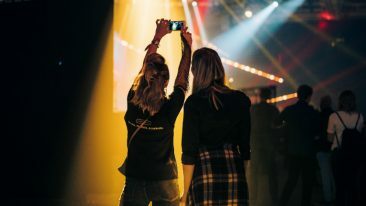 If day one of Slush was characterised by the steady hum of buzz and high energy interaction, judging by the long queue snaking its way to a coffee stand at 10:10 am on day two, it’s abundantly clear that people are seeking to refuel their enthusiasm. But, almost like clockwork, things are soon back at a more familiar pace. An hour later, Maija Itkonen from Gold&Green Foods steps onstage to discuss the meteoric rise of her company’s high protein vegetarian product, more commonly known as pulled oats. Given that she is Finnish, it’s also no surprise then that when she explains the swift path of the product’s success, her tale is nothing but matter-of-fact. This means that projected revenue is 35 million euros and expansion to Sweden is on the agenda. Over on the Green Stage, scientific endeavour is being encouraged in a different form. Fortum president and CEO Pekka Lundmark is rethinking energy for a captive audience. The words ‘Disruption’ and ‘Huge Potential’ loom large behind him. 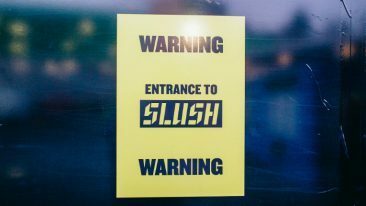 All roads lead somewhere at Slush. Challenges of a more familiar kind are still ongoing for some bleary eyed event-goers: the coffee queue isn’t getting any shorter. Fittingly, the event space also continues to fill up, with elbow room becoming a rarer commodity. Shuffling past the Yousician stand, a wall of ukuleles looks down at the milling crowd, together learning a quick fix when picking up an instrument. Music is also the theme at the Black Stage, featuring Martine Reicharts, the European Commission’s directorate-general education and culture. One of the highlights of this year’s festival has been the variety of foods on offer; a wealth of flavours and cuisines matched only by the diversity of languages being spoken in the Food Court area. Fittingly, the topic of food is still lingering onstage, with yet another fascinating solution to influencing future dining being presented. Uma Valeti, co-founder of Memphis Meats, tells how his company is tackling the global problem of meat production. Did you know that it currently takes 23 calories of grain to produce every calorie of beef? Valeti urges the audience to keep this in mind, as demand for meat is tipped to double in the next 30 years. So, what is his company up to? The genetic results have been truly ground-breaking, and apparently flavoursome, as the company is betting on the fact that meat eaters will consume their dietary staple regardless of how it’s produced. By now the event is in full swing. Stands are full of excited punters checking out everything from dating apps for the introverted to next level smart glass solutions. Passing the Green Stage on one final round before calling it a day, Jukebox’s Ed Newton-Rex is posing the question whether audiences can tell the difference between a piece of music composed by a real person or a computer. Interestingly, the more intricate of the two has been composed digitally. More surprisingly, however, is that digital composition is not so fresh a concept. “The idea of computers writing music goes back further than you might think – 150 years ago,” Newton-Rex declares. 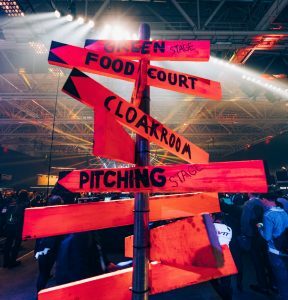 Amidst the various ideas and concepts driving the future at Slush 2016, one wonders which of them will be still having an impact a century and a half from now. I guess the only way to find out is to stay tuned for Slush 2166, then. 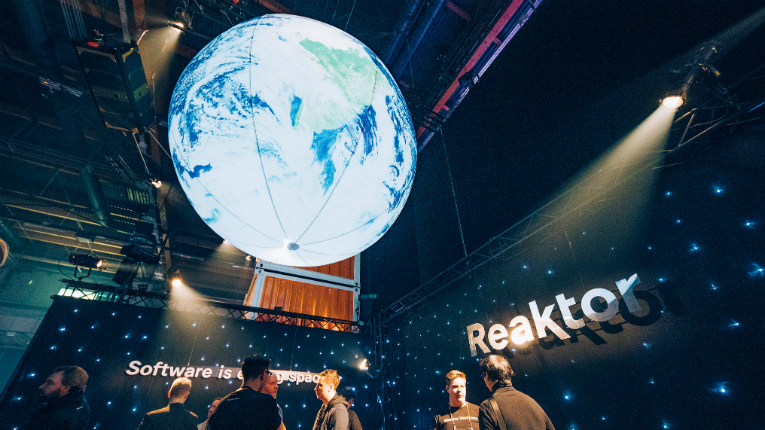 Reaktor’s idea for a satellite is truly out of this world.